Posted 4/10/2019 4:05pm by Ryan Lacz & Liz Balchin. 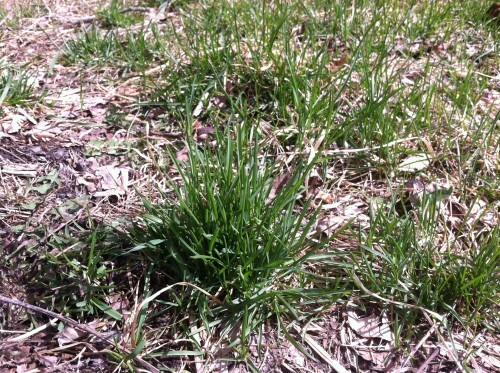 Ahh, the greening of grass in Spring! While this image might bring dreadful thoughts of having to mow the lawn, we at Four Fields Farm are really excited! True, farmers might not have the most glamorous of lives to be excited by grass growing, but it is something we look forward to every year. 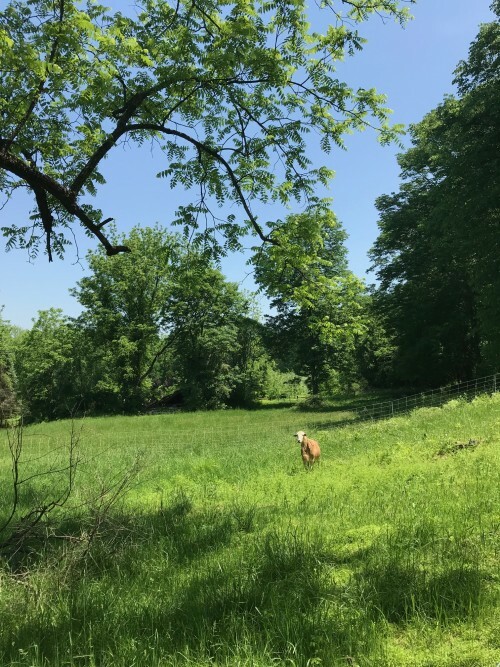 But it's even better for our animals & land- fresh, lush pastures for eating (our nursing ewes need the extra nutrition), more diversity in the animals' diets (wild flowers, multiple species of grasses, fresh shoots off bushes and shrubs), and soil building through allowing pastures ample rest between grazings. We'll be getting everybody out onto fresh pastures this week, as we like to give the grass a head start before the sheep chow down. The wild birds have come back to nest in the dozens of nest boxes we've put throughout our pastures- bluebirds, swallows, wrens, and chickadees. We give them a dry house and predator protection, they help us keep our fly populations in check around the livestock- no need for chemical pesticides! It is a delivery weekend to Chester (11-noon), South Orange (11-Noon), and Madison (12:30-1:30) this coming Sunday, April 14th. We just got back a few hogs from the butcher, so we have all chops, bacon, and sausage in stock. We also have a limited amount of lamb left, if you want any for the upcoming Holidays. Finally, the ducks began laying again, so we do have some duck eggs in stock! Now go watch the grass grow! Posted 3/29/2019 6:28pm by Ryan Lacz & Liz Balchin. We got our first delivery of mushroom blocks for our indoor growing chamber. The first few weeks will be fairly experimental, as we get out settings just right for growing top quality mushrooms- humidity, air flow, light- it's all a fine balance when growing indoors. Growing indoors will hopefully allow us to grow mushrooms year round! We'll keep you all posted as to how they are coming along, and when we'll have them ready for sale. Lambing is going well with 5 new additions so far, and we're expecting at least 10 more to come in the next week or two. If you haven't been following them, Liz is doing a great job with posting pictures and videos of the Spring babies on Instragram and Facebook! The piglets have emerged from the security of their nest, and are following their mom around, wrestling with each other, and starting to root & forage for goodies. Very cute to watch- a 600 pound sow with an entourage of tiny ones scrambling behind her. We do have a Chester delivery coming up this Sunday, from 11-Noon. Be sure to plan ahead for Easter if you want some of our 100% grassfed lamb- roasts, chops, and ground. Posted 3/7/2019 6:14pm by Ryan Lacz & Liz Balchin. Thinking Spring thoughts (and looking at the weather forecast...), helps get me over this last round of 7" of snow & plowing & ice. I did learn my lesson from the last 3" to fully plow the driveway- the last one only melted half way then re-froze into a 2" sheet of ice. Not so much fun as I slid off the car off the driveway onto the front lawn...March has a funny way of remind me every year that winter isn't quite over! But- the next few weeks will also remind me that Spring is really just around the corner. The first batch of chicks arrive, lambing begins, our sow is due to farrow (a fancy farmer word for pigs giving birth- your next scrabble word! ), mushrooms logs will be cut and inoculated, maple trees will be tapped for syrup making. The layers are starting to ramp up egg production too, as the daylight increases- we're up to 100 a day on average & are aiming for 180 a day during the peak summer season! We have our monthly South orange delivery this coming Sunday, March 10th from 11-Noon, then on to Madison from 12:30-1:30pm. Eggs, chicken, lamb, and pork are all in stock. Posted 3/1/2019 5:58pm by Ryan Lacz & Liz Balchin. Just a quick note before I collapse onto the couch (it's been a loooong day!) to remind everyone that the next a la carte delivery to Chester, NJ is this coming Sunday, March 3rd from 11-Noon. Skip the trip to the grocery store before the snow storms hit and stock up on some local goodies. Plenty of eggs, 100% grass fed lamb, pork and chicken available! Posted 2/13/2019 5:22pm by Ryan Lacz & Liz Balchin. Just a quick reminder that time's running out to get 5% off a Spring CSA membership- the early bird discount expires midnight of Feb. 14th- Thursday. We've had a great response so far this month with CSA signups, helping to put the farm on track for the Spring rush of activity. CSA memberships truly help farmers in the Spring, as a LOT of capitol gets invested in seeds, feed, butcher fees, and mushroom spawn long before anything can get harvested. Especially being a small farm, we couldn't do it without you!!! So, put off that ice scraping and snow shoveling, and check out what we have to offer this year! Weekend deliveries, Lamb in Stock, & New CSA Season! Posted 2/6/2019 5:04pm by Ryan Lacz & Liz Balchin. Busy times! The last few days of 60 degrees reminded us all that Spring is fast approaching, and we have much to do to get our ducks (literally) in a row before the season kicks into high gear. 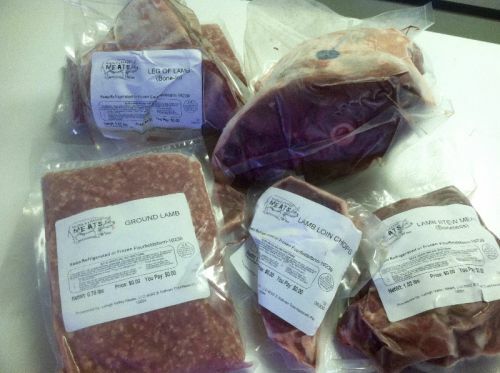 We will have 100% grass fed lamb in stock again for this weekend's deliveries! Check out our online store for the various cuts we offer. Genesis Farm delivery is Friday the 8th (flexible time starting at Noon), South Orange (11-Noon) and Madison (12:30-1:30) are Sunday the 10th. Lots of eggs available this week, as well as pork & chicken. We're pairing with Let It Grow, an organic vegetable farm in Chester, NJ offering our meats for their CSA customers. Early bird 5% discount runs until Valentine's Day- what better way to say "I love you"! You can read about our Traditional CSA here. Ready to sign up for a monthly membership, click here. Any questions, let us know, we're glad to help! Posted 1/31/2019 5:21pm by Ryan Lacz & Liz Balchin. Yup, it's cold! The animals are doing well with the temperatures: everyone has shelter, and we make sure there is plenty of dry straw for them to bed down in. The sheep are fed a top quality hay for extra protein & energy. One of the benefits of feeding a grass only diet is that they keep warmer, as their guts actually generate heat through the digestion of grass fibers. Amazingly, the chickens have actually increased egg production the past few weeks- their new winter greenhouse home is working out well. Not a single frozen egg this year, and it was in the low 50's inside the greenhouse this afternoon, while there was a 0F windchill outside! We have a Chester, NJ delivery coming up this Sunday, between 11-Noon. Lots of eggs! Chicken, pork and a few sheep fleeces available too. We just dropped off lambs at the butcher today, so will have lamb available again late next week! I'll send an email when I update that inventory. Posted 1/16/2019 6:04pm by Ryan Lacz & Liz Balchin. Looks like it's finally going to snow, so we're going to switch this weekend's delivery to Chester to Saturday the 19th, 11-Noon. No need to fight the grocery store lines to stock up on meat and eggs! What better way to weather the storm than some hearty pork stew, slow roasted pork shoulder or ribs, roasted chicken- if you're stuck inside, you might as well eat well, right? Rent a few good movies and cook up a storm! Posted 1/3/2019 5:05pm by Ryan Lacz & Liz Balchin. New record for precipitation since record keeping began in 1895: we received 72.2", that's 2 FEET of extra precipitation this year, gross! As for 2019, we are planning on expanding our mushroom growing venture, will work on renovating our back 25 acres of pasture to get better grass and clover varieties, we're looking into growing cut flowers in our new greenhouse, and (as always) build more fencing so we can better utilize the land. One of our main long term goals is to graze the sheep on our stockpiled pastures throughout the whole winter & become a hay-free farm! I've set the delivery dates for a la carte orders for Chester (This coming Sunday, Jan 6th), South Orange, Madison, & Genesis Farm. We are no longer doing the indoor winter market at Stroudsburg, PA every week, but are looking into possibly once a month- more to follow on that. We do have some sheep fleeces still available, both from long wool and short haired sheep. Wishing you all a great 2019 & hope to see you soon!